As many of us in Minnesota get ready to head up to the cabin (maybe for the first time this year!) over the Memorial Day Weekend, I started thinking about cabin décor. Luckily, there are fabulous pieces to be found at occasional sales. But how about some inspiration in putting it together? [Photo above] A rustic hideaway (with fancy curtains!) from Architectural Digest. Brown and green work beautifully for this lakeside retreat – and could for you, too! [Photo above] I love this one from TheHandmadeHome because it feels cabin-y with the knotty pine walls and ceiling, rafters beams (is that even a correct term? ), wood floor and antlers. 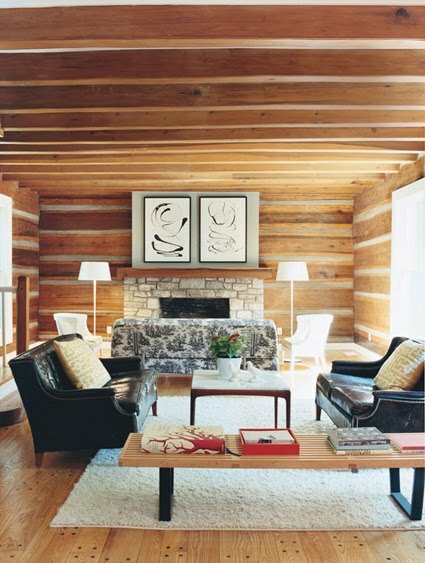 At the same time, the two framed-in yellow knotty pine sections of the wall add pop, but stay true to a wood cabin. The mod white chair and bubble lamp give the room an element of surprise in form (but not color or function, which is why they work). [Photo above] This traditional Swedish interior gives the cabin a more home-y vs. cabin-y feel with the white painted walls and ceiling, as well as the soft blues, yellows and greens. 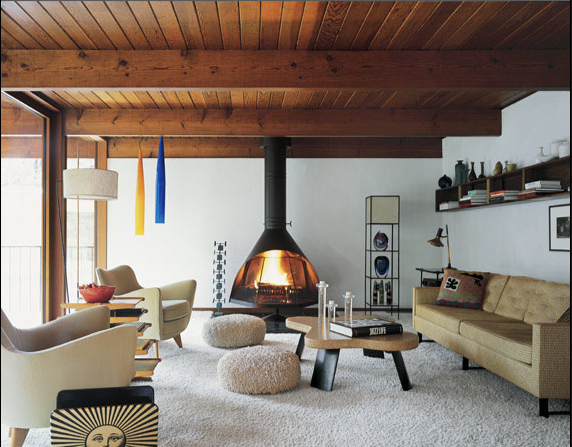 However, the simplicity of the décor helps the space feel peaceful, and the rock fireplace brings nature inside. 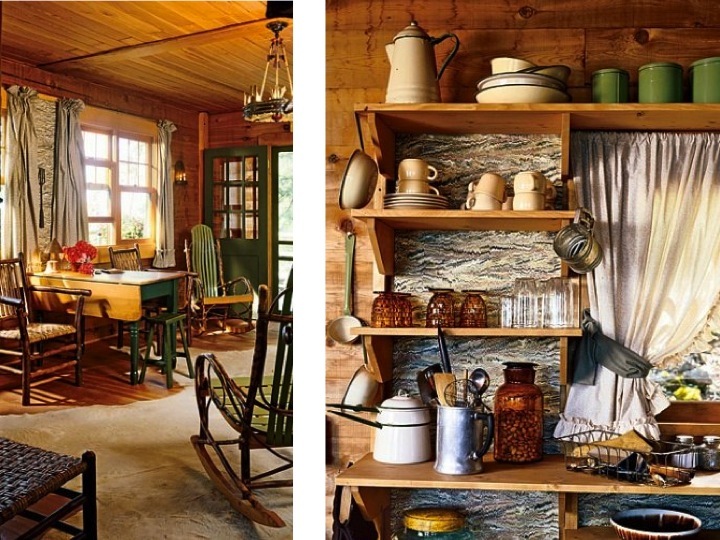 From Cottage Home Decorating. [Photo above] Contemporary, but retains classic woodsy elements such as the light wood floors, striped wood walls and rock wall fireplace. Just add a bit of leather, some pops of white and a slatted wood bench with black industrial legs, and you have contemporary cabin! From Cookie Magazine seen on Head Over Heels. 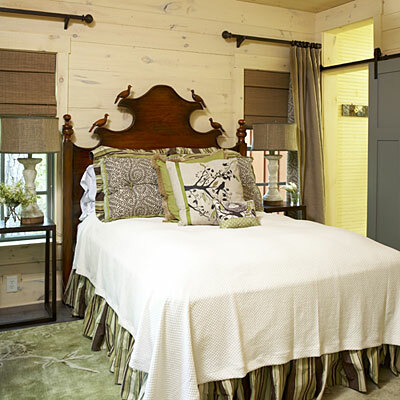 [Photo above] And now for something completely different (sorry, Monty Python reference)…from Southern Living, this bedroom offers a light, bright, lush take on country. 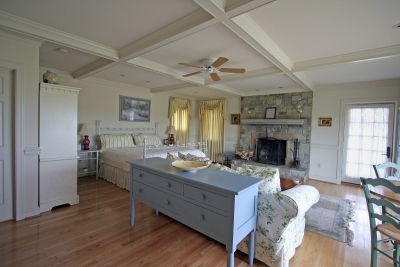 [Photo above] Another great find on TheHandmadeHome, this lovely bedroom comes from Trendey. Love the silhouette on the wall! 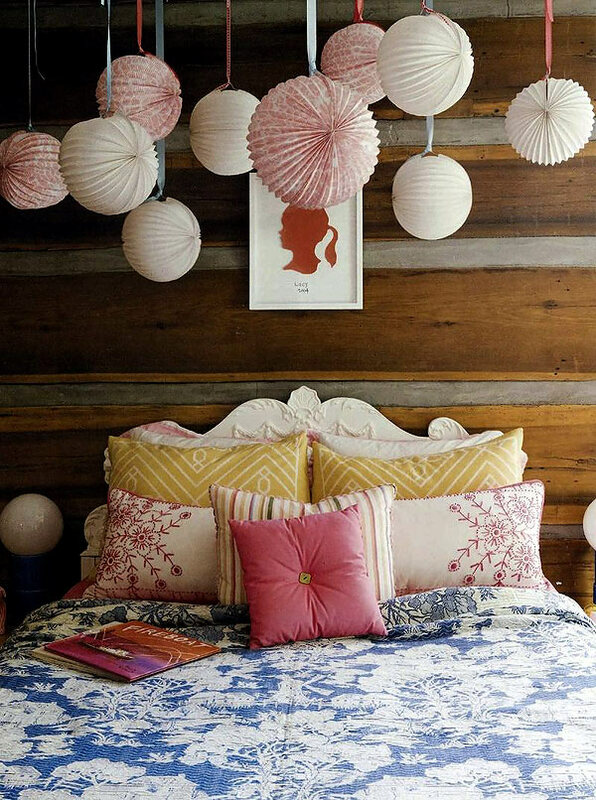 That combined with the fun paper hangings and bright, feminine bed coverings soften a rather rugged looking wall. This entry was posted in Eye On... and tagged AD magazine, Architectural Digest, cabin decoration, charming cabins, chic cabins, chic country retreats, chic northwoods cabins, contemporary cabin\, Cottage Home Decorating, Head Over Heels blog, northern retreats, Norway cabin, Scandinavian retreat, Southern cabin, Southern Living, Swedish cottage decorating, Swedish cottage style, The Handmade Home, Trendey. Bookmark the permalink.